We empower entrepreneurs to create their dream business, minus the busywork. Merchants use our platform to open stores spanning all product categories. 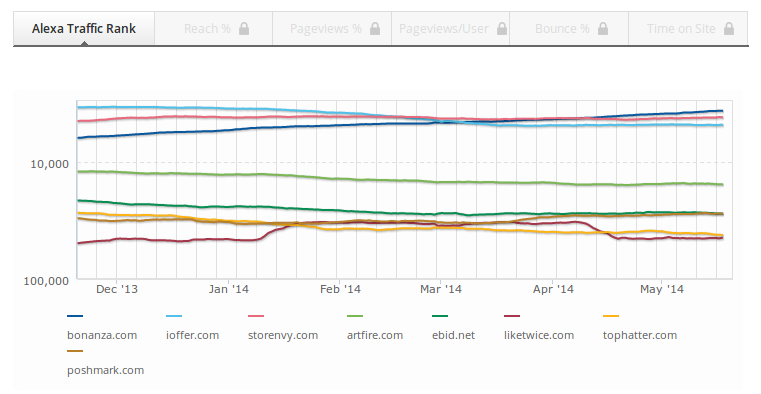 We believe Bonanza is the best platform for selling online, and we've got the growth trajectory to prove it. In 2015 alone, we doubled the size of our product catalog, tripled our sales revenue, and our average seller doubled their monthly sales. Alexa now calls us the biggest marketplace this side of Etsy. Meanwhile, over 12,000 independent sellers declared that they would recommend Bonanza to a friend over Etsy, eBay and Amazon in the Ecommercebytes 2016 Annual Sellers Survey. We have a unique opportunity to making selling online better for busy entrepreneurs, and we intend to use it. Watch: What's it like to work at Bonanza? Who succeeds in a culture like this? People who want to build things that have never been done before. People who get excited about empowering others. People who are comfortable with -- nay, thrive on -- rapid, constant change. We believe a key to our longevity is pace. While some tech companies measure "employee success" by how much work can get squeezed into a 12 hour day, we've found our productivity is maximized when living a fulfilling life doesn't get short shrift. Winters can be a real drag. Every February, Bonanza moves the offices to a tropical paradise for a few weeks. All employees (and their families) are invited to come enjoy the sun. Great work doesn't have to happen in the office. Every Wednesday, we get to work from home (or anywhere). This lets us stay up late, skip the commute, and get a change of scenery. Life at Bonanza includes lots of time to unwind and recharge. Our team enjoys abundant vacation time, paid holidays, and two weeks off at the end of December. Crunching is for companies that plan poorly. Our sprint schedule is planned in advance and carefully managed to ensure that employees keep their work/life balance intact. Who says there's no such thing as a free lunch? We serve delicious, healthy, free meals to the whole team twice a week. We also have a fully stocked kitchen with a variety of snacks. We take relaxation very seriously. Our licensed massage therapist visits the office every week, providing each person with a free massage in the comfort of our wellness room. We hire extraordinary people and we compensate them accordingly. We've done the research. You'll earn more with our competitive salary and 401k package. The health and wellness of our team is very important to our success. We offer fully-paid medical and dental benefits for employees (and cover 50% for dependents). Bonanza is a fast-growing and already profitable company, and we want our team to share in our success. That's part of the fun of working for a winner. Five million users making 40m monthly pageviews across 30 servers with 99.99% uptime? That's what you walk into on day one. The right candidate for this job knows that when you're proactive about managing and monitoring servers, DevOps is less about firefighting and more about empowering millions of users via a well-crafted infrastructure.